Giuseppe Pellicano's ceramic "Trench Art." A ceramic mug rests in an anonymous space on a flat white surface. The mug inhabits the shot. We get to eyeball its glazed surface for approximately 1.5 seconds before it explodes. A different cup reappears in the same spot. The sequence repeats again and again in Marine veteran and ceramicist Ehren Tool's 2007 video, "1.5 Second War Memorial," featured in The Dirty Canteen: Contemporary Art Made by Military Veterans showing at College of the Redwoods. The unseen marksman keeps on shooting at precisely timed one-and-a-half second intervals. He or she never misses the mark, obliterating 99 of them in the course of the video's one-and-a-half minute running time. There is no commentary. There is no noise except for the clipped retorts of the unseen gun, which is less dramatic than in films. Ceramic cups are among the most ancient elements of material culture; their broken shards are used to date ancient civilizations. They are still the basic utensils of hospitality in much of the world. Perhaps this is why it feels unseemly, watching hand-thrown ceramic cups lined up one by one for our inspection before being obliterated. It's obvious that the spectacle of destruction has been produced for us to witness, with us as consumers in mind. This can make a viewer feel implicated. You might ask yourself, aggrieved: What does this wanton destruction have to do with me? Guns don't speak, but if this one did I'm pretty sure it would be repeating the monosyllabic command: Look. Look. Look. Flip side of the coin: The experience can actually be quite soothing, once you get used to it. Sit down on the blessedly comfortable gallery bench, relax your eyes, let the video cycle, and see if you aren't lulled into quiescence. Punctuating gunshots move in and out of phase with the beating heart. Repeating at that speed, violent images anesthetize and blur. That's entertainment! The cups are surrogate soldiers. The video is a death-directed timepiece. I asked the artist about the pacing and he wrote in reply: "I made the video and shot the cups with a pellet gun." If you were to use this video to measure out the number of US casualties in recent conflicts, "for US casualties it (would be) a few minutes. For everyone killed in World War II, all sides, in all theaters it (would be) almost three years. It makes me sad that the video looks so dated and yet is still counting bodies in Iraq and around the world." The use of the word "shoot" to describe what one does when operating a camera has become so much a part of common parlance, it's easy to forget it started as metaphor. Tool's video forcibly reminds us. Cameras, clocks and guns have more in common than meets the eye — not least a reciprocal interdependency in the age of the 24-hour news cycle, with its insatiable need for new forms of spectacularized violence. 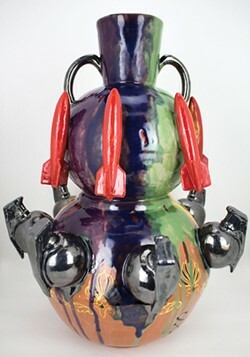 The ceramic cups in Tool's art multitask — they function as tokens, gifts, photo and video subjects, soldiers, scapegoats and stand-ins. They have a social and conceptual dimension. The artist likes to give them away. When he lectured recently at College of the Redwoods, he said that what he likes about the cup as a form is the potential for communication it holds. Each cup that passes from Tool's studio into private hands represents an encounter and a conversation. Because of the imagery the cups depict, it seems likely that most of these conversations will be about war. "I have made and given away more than 14,100 cups since 2001," Tool wrote. "I believe the cup is the appropriate scale to talk about war. The cups go into the world hand-to-hand, one story at a time." He and the other six artists in this exhibition belong to a group of veterans who call themselves the Dirty Canteen Art Collective, defining themselves as "soldiers and humanitarians." In their current series of exhibitions, collective members aim "to raise awareness about issues veterans face while returning home from conflict." In this show, artworks by Jesse Albrecht, Drew Cameron, Amber Hoy, Aaron Hughes, Ash Kyrie and Giuseppe Pellicano explore the experience of military service at home and abroad. There's plenty to see within the Creative Arts Gallery's deceptively intimate confines. Artists' work range across media in the familiar contemporary manner. Albrecht shows illustrative ceramics. 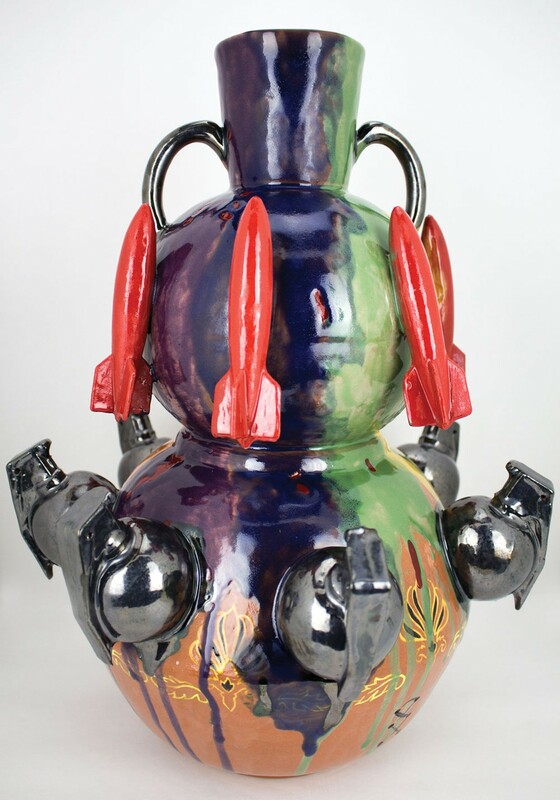 Pellicano shows shiny, colorfully glazed ceramic sculptures shaped like bombs. Army ammunitions specialist and Iraq war veteran Hoy shows photographic portraits of women in and out of uniform, accompanied by audio recordings of enlisted women speaking about their experiences of military life. A wall filled with posters, broadsheets, and flyers by Hughes is collectively titled "Celebrate People's History: Iraq Veterans Against the War — Ten Years of Fighting for Justice and Peace." Second-generation papermaker, forester and former Army soldier Cameron works with a group he co-founded called the Combat Paper Project, printing combat zone images on sheets of handmade paper that have been made, most improbably, out of military uniforms. And Iraq war veteran Ash Kyrie shows three ceramic bowls with nubby interiors that he calls "skull grinders." The bowls are, he says, based on Neolithic ceramic forms that allegedly served cavemen as personal massage devices. For what it's worth, when I Googled that phrase the hits that came up all had to do with bong accessories, but like Emerson once noted, "a foolish consistency is the hobgoblin of little minds." The Dirty Canteen: Contemporary Art Made by Military Veterans Is on display at the College of the Redwoods Creative Arts Gallery through Nov. 17. Ehren Tool's 1.5 Second War Memorial is posted on YouTube. See more work by Dirty Canteen artists at www.dirtycanteen.com and www.veteransbookproject.com.